Wimbledon - We love spring! Our site is transforming every day. We love Spring! With the warmer weather following a number of damp weeks, we have plants, flowers and shoots springing up everywhere! It's absolutely beautiful. You may catch us saying this more than once a year, but this really is a special time of year. We had a week of finding exciting fairy discoveries. We've been on adventures to see if we can find any secret trace the fairies may have left behind. We've found fairy houses, including a beautiful little house with a purple door which magically disappeared and left our children entranced. 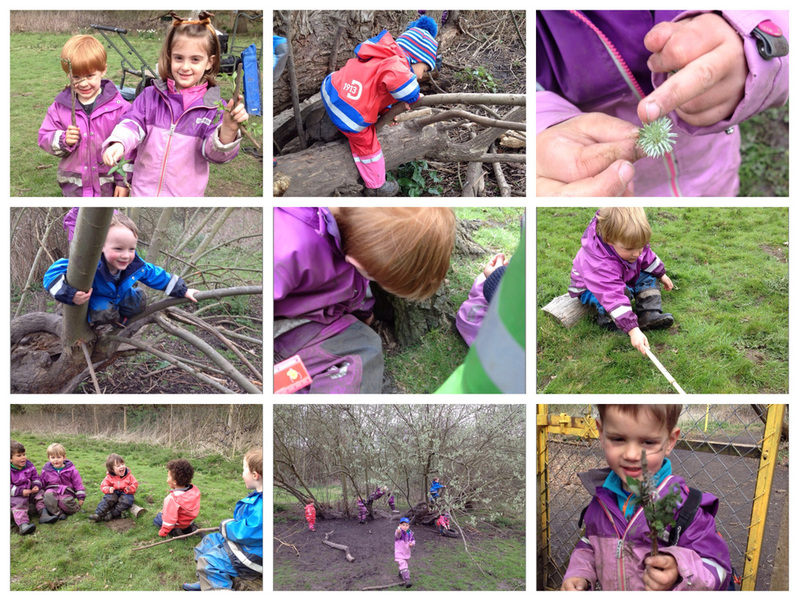 We found flower fairies and fairy swings and even the odd gruffalo was spotted on our travels.We went on nature hunts to find suitable natural materials then used our tools and our imaginations to craft beautiful fairy wands. 'Stella, fairy of the forest' has been our favourite fairy story this week. It's been a great week for wildlife, both real and imaginary. We've spent some time hiding amongst the growing reeds near our swamp to spot crocodiles....then have been transformed into zookeepers who are responsible for feeding the crocodiles and all the other animals at the zoo. We've had hawks flying overhead and have one afternoon whilst on an adventure to the wider nature reserve spotted a beautiful heron. We've been busy crafting. We've made hedgehogs, we've made potions. We've made handprint butterfly and fingerprint blossom pictures. We've been whittling sticks and are becoming more and more confident and responsible with our tool use. 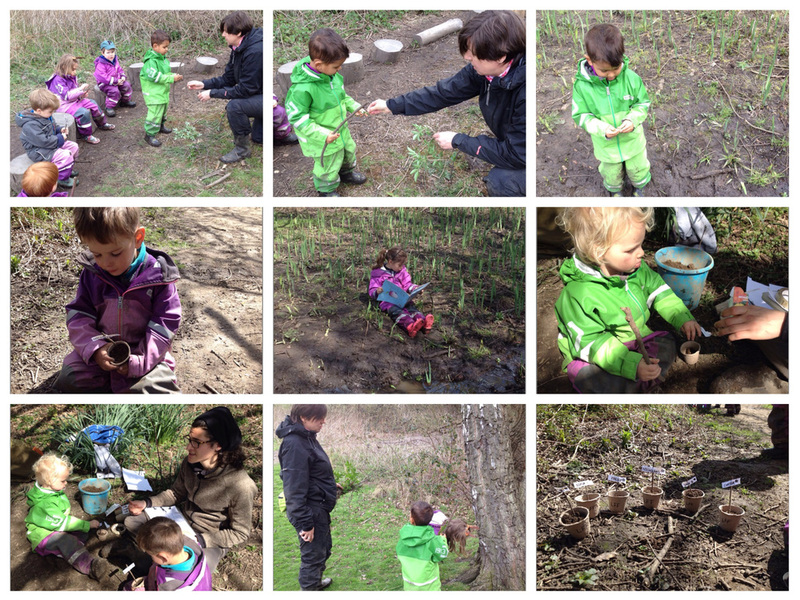 As it's Spring, we've learned more about growth through experimentation and sensory adventures. We read 'Eddie's Garden' to learn more about vegetables, planting and growing. We've planted seeds, we've then counted flower pots and have written our names on flower pots. We've searched for plants and flowers at various stages of Spring growth and have touched, smelt and measured as part of our exploration. We've built a mini fire circle and have roasted 'marshmallow' leaves and 'chicken' twigs. We've climbed, jumped and balanced. We've swung in our 'boat' hammock. And we've even had an archaeology session where the children were dedicated to their task as they patiently used brushes and rakes to unearth treasures. Finally for cookery classes we made seed topped bread rolls with a smoked mackerel pate and marinated olives. Yum! We plan to continue the Wednesday afternoon cookery classes for the remainder of the term so just a reminder please that as the children are cooking their own dinner, they eat a little later than usual on Wednesdays and Thursdays. To be sure that they've had time to finish the delicious fruits of their labour, we'd be grateful if you could collect from 5.30pm. Friday April 29th: Oxfam ‘dressed by the kids’ challenge! Please send in your most flamboyant and eccentric, weird and wonderful outfits for the children to dress our practitioners in. The warmer weather (fingers crossed) looks here to stay! We'd like for Spring to recommend warm wellies. These wellies are neoprene based which makes them extremely flexible for easy running in, plus they have great grips and are much warmer than standard wellies so we highly recommend them. Next week in the forest we are going to be talking more about flowers. We will talk about bees, pollination and growth of flowers. We will take walks around the site recording details of flowers by drawing, recording on digital cameras and writing descriptions. We will be making flowers crowns and will even attempt our own perfume! We are excited to begin our adventures again in the forest next week. Until then, have a lovely weekend.